Hello Robert, our judges have each reviewed your website, and we are very pleased to award you our bronze awards. While your site contains much wonderful information, we assess on many other things besides content. Actual content only picks up 30% of the points. You will find 2 other awards also. One is the YANA [you are not alone] award from my Hugs R us site. This is unrated, and offered to excellent websites like yours, that have a basic mental health theme, and yours certainly qualifies. I am still working my way through it. You have done a wonderful job of putting 'it' all down for your readers and I commend you for your hard work and sincerity. This is my first YANA of 2006. You will also find my Whimsy award, also non-rated, that I give [on a whim] to websites that I personally like. WOW! I am really at a loss for words - unusual for those who know me. I find great strength reading your pages. They are truly inspirational, and I thank you for writing them. So, here is our new awards page - posted February 1, 2000 - just in time for the first anniversary of the Joy2MeU web site on February 4th, and a few weeks before the Two year anniversary of the Joy to You & Me web site whose first crude pages were uploaded February 28th 1998. Some of these sites are no longer in existence - so I have removed the links but left the award posted. These pages are designed to be viewed with a normal size 12 point font. If the type looks large and the pages out of balance it could be the setting in your browser (Explorer usually comes set at 16 point.) In Netscape the setting is in: Preferences (under Edit); Appearance; Fonts: Variable width font. In Explorer Preferences (under Edit); Language/Fonts. In AOL pull down menu under My AOL and choose preferences. Select the symbol on the left that is WWW and then click on Advanced settings. In the upper middle it says Text Size - 5 settings from smallest to largest. The Joy to You & Me Web Site has been selected for an award called Healing Hurting Hearts - for helping in that healing. We are happy and proud to accept this award and to be associated with Laura's Lee - the Web Site that originated the award. 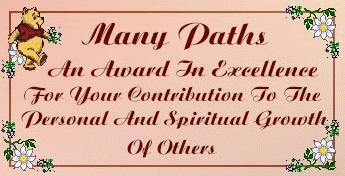 Many Paths contains vast resources for personal and spiritual growth, and specializes in life changing events in people's lives with excerpts from the book, "Life and the Art of Change." To enhance this topic, a scheduled and hosted chat forum is available, as well as an e-mail discussion group. Art, poetry, music, 400 quotations and over 400 pages of excerpts from many other books are only a few of the features found at this huge site. 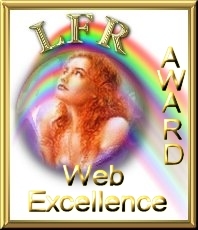 This award (left) was presented to this site for excellence in promoting empowerment by http://www.lollie.com/. We are honored to present your Website the Lotus Light Award for web excellence. Our multi-denominational organization, SpiritNetwork commends you on your wonderful site. The Lotus Light is awarded on the basis of useful information content, presentation of content, and graphic design, in that order. Each recipient is chosen from a group of Websites which are nominated by a staff member or any individual who chooses to nominate a site. Keep up the great work you're doing as a valuable resource on the Information Highway! 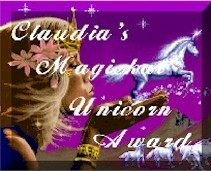 This beautiful award came from a beautifully designed and very comprehensive site called Ask Claudia Psychic/Healer. "I have spent many years developing my Balanced Energy System. This system is a combination of many different techniques for healing on all levels. I feel that all dis-ease begins in the emotions. If you heal the emotion, then healing will occur on a cellular level." The Healing Techniques Claudia uses include: Healing Touch, Reiki, Emotional Healing, Crystal Healing, Soul Return, Inner Child Healing, Past Life Therapy, Spirit Depossession, Distance Healing. She also offer healing for pets. Her Spiritual Counseling includes Intuitive Counseling, Psychic Readings, Past Life Readings, and Angel Readings. 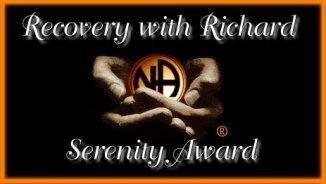 This is the Grant Me The Serenity...Spirit of Recovery Award. 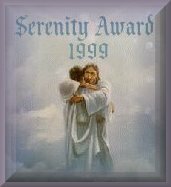 The Grant Me The Serenity Site is one which I added to my recommended links page several months ago. It is a large directory of self-help, addiction, and recovery information. "Congratulations! !......Your site definitely qualifies for the "Critical Mass Award". A very nice site, good design, tasteful graphics, and your content is informative, entertaining, presented well and easy to access. A worthy enterprise and a positive contribution to the Web. Thanks for helping make the Web a more interesting, fun and attractive place to visit. I really enjoyed my visit to your site and will return again when time permits :)"
Congratulations! We have reviewed your site, and it certainly qualifies for our OmPlace Award. Good job! This award is presented by the Editors of OmPlace, The Conscious Living Directory and Alternative NewsRoom, in recognition of websites that contribute to the Conscious Living Community worldwide. The following criteria have been used to qualify for this award: There is substantial content that supports Conscious Living. The website design is reader friendly and easy to navigate. The website demonstrates community support by linking to other Conscious Living sites. The website demonstrates integrity, excellence and creativity. There is a positive message for website's visitors. The NBCi Directory team is pleased to inform you that a site you submitted to NBCi LiveDirectory: http://Joy2MeU.com/Relationship.html Has been promoted to the Top Sites Directory, NBCi's premier collection. Each site in NBCi's Top Sites Directory has been independently reviewed by one of our editors and placed where it will be available both in the Top Sites section of search results and in our topic-based directory of Web listings. After reviewing your site, you have been awarded the Promises of Recovery Award. Promises of Recovery is a website is dedicated to all the people that are struggling to become a better person, and to those that struggle because they do not realize there is a better way to live. You have been chosen to receive The Place of Peace Award for notable homepages from Spirit Search. The criteria judged for this award is based on content, overall design, ease of navigation and loading time. Nominee homepages can include some commercial content, but above all be informational or inspirational. Congratulations! We have reviewed your website, and it certainly qualifies for our ByRegion Award. Good job! We are happy to be associated with your website! A new Directory, ByRegion.net organizes local artists, musicians, writers, performers, healers, bodyworkers, healing activities as well as related products and services by region. After looking over your site I must say that it certainly deserves one our of Light Awards! May the light be with you ! This award is from Stepping Stones - A spiritual co-op of light workers. Read an enlightening experience, put in a request for healing, shop for the unusual, post a message or just plain explore the path! Your site has been selected as a winner of the Healer of Souls Award. Sites selected for this prestigious award are sites dedicated to health and healing of the body, mind & spirit. 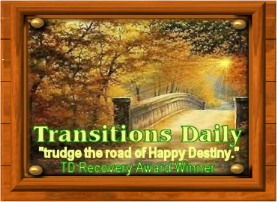 After review of your site, It is my honor to present you with the Transitions Daily Recovery Award. Transitions Daily Recovery Resources Features Free Daily Emails of Daily Readings - Thought for the Day, Daily Reflections, 24Hours A Day, As Bill Sees It, Big Book&12&12 Quotes. We are a Website with info. and help for people suffering from Alcoholism. Full of goodies about recovery, Also includes AA Links, Prayers, e-cards, Webrings, other recovery sites. Congratulations! Your site has been added to our Spread The Light Award Page. Healing Hands Society A Healing Place For All Your Healing Needs - Our goal is to do what we can to help heal the world one person at a time. We believe that by sharing our views with as many people as we can those we share with will in turn share what they have learned with those around them, and they will share with those around them and so on. Includes rooms for: Karmic Kleansing, Genealogy Reseach, Abundance & Prosperity, Color and more. My name is Ruth Tyger. 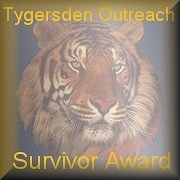 I am the owner of my website forum and support group as well as an ezine all called Tygersden Outreach. I help support other survivors like myself overcome the lasting effects of childhood sexual assault. I would be honored if you would let me use some of your articles in my ezine. Thank you so much!!! I truly love your work. Dream's Place part of MSN community thefirstdreamsite. Linda sent an e-mail saying, "What a great site" and presenting Joy2MeU this award. Unfortunately this site has disappeared from the internet but I like the awards so I am keeping them here. "Congratulations on receiving the Point Of Life Gold award of Excellence for your Great Happy website that aids many people to enjoy life. In Love & Joy" - Michael Levy. This award was presented to Joy2MeU.com by the Point of Light web site of inspirational author Michael Levy. Michael's philosophy provides understanding that cause peoples problems and provides them with the methods to manage their lives in enjoyment without a dependency on drugs or dogma. With an elevated spiritual awareness, people will obtain optimal self-power. This will provide folks with wise solutions to ongoing problems and issues that confront them on a daily basis. "Please accept these two awards for your awesome site and for making a difference in lifes that you touch with your web site. huggggggggggs"
(Posted 2-2-2003) Until I posted an new award in early February, I had the poem below - and the link to a poem lower right - on my New page instead of any awards, since the poems are a special kind of award. I will now be leaving them on this page. Here is a poem that has been posted on the internet as a thank you to me and my web site. Very cool. ;-) This poem was written by Rose and is on the My Wish page of her web site. Of a man I've never met. This wonder called the Net. I'm learning to deal with the pain. Is no longer another train. Sorting my life, the mess. My wounded self I do see. If I was granted a single wish. "You've made a difference to this starfish"
Another Poem dedicated to Joy2MeU - Terror Within In September 2002 I got this e-mail from Finland: "In my recovery from childhood wounds, codependency and finally from falling in love (against my will) with an emotionally unavailable addict, your book and your website have been my main source of hope. I learned that I was another addict. Less than a year ago my life collapsed but already now it is better than ever. I dedicated a web page for you." The poem is called the Terror Within, and carries this line at the bottom of the page: "This page is dedicated to Robert Burney whose writings have given me the courage to face the terror within." The dedicated page Terror Within is one of many pages including recovery poems on the web site Home of Healing Eagle. In January of 2004 Healing Eagle wrote me to let me know that he and some friends are translating pages from my site into Finnish. I have added links to those pages on the index page for the Romantic Relationships section of my site. Codependence: The Dance of Wounded Souls by Robert Burney is copyright 1995. Material on Joy2MeU web site (except where otherwise noted) is copyright 1996 through 2006 by Robert Burney PO Box 977 Cambria CA 93428.